So, after we left the yakitori place, we went to a wine bar. Wine was so-so, but the whole pig’s leg sitting on the bar was interesting. 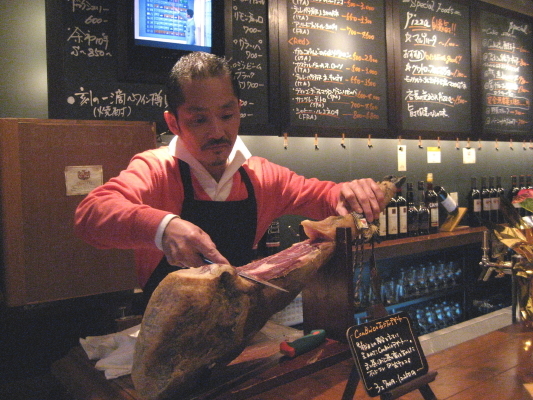 When Yukio asked for prosciutto, the barman just got out his carving knife and cut some bits off for us. It was the best prosciutto I ever tasted. 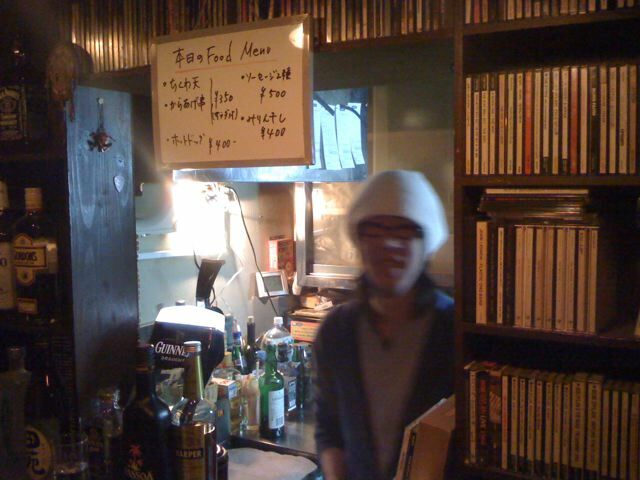 After the wine bar, Yukio said his friend runs the best sushi bar in Tokyo and it was just around the corner. So we went there and had the best sushi this side (actually, the other side) of Nagasaki. 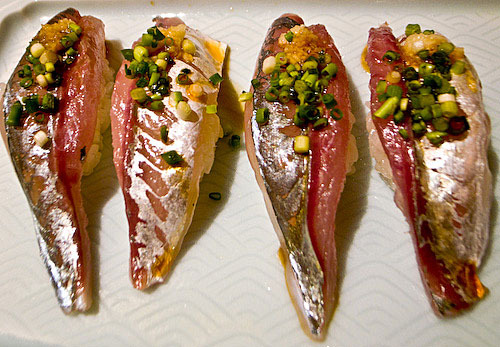 If you ever go there, have the mackeral – it’s like raw fish from heaven. Oh..and we had some more sake. A lot more. By this time it was after midnight (+7hrs for the jet-lagged among us) and Australian Jeff wanted to go back to the hotel. I wanted to go too since my big presentation was the next day (and I was jet-lagged) and I didn’t want to wake up with a hangover – but I was outvoted 2 to 1, so Mirek, Yukio and I jumped in a cab to the famous Bar at Kanda. I had heard about the bar from Jeff and it goes by several names. It’s in Kanda (hence, the Bar at Kanda), the home-made sign on the door says Crossroads but Mirek referred to it as the One Coin Bar because every thing is the same price – one 500 yen coin. It’s a bit of stretch to even give the place a name, ahseb u ara three, because it’s not big enough to deserve even one. The bar is about 3ft by 10ft inside – not including the 3ft square where the barman hangs out. That’s about the size of our walk-in closet and, with 13 patrons, it was rather full. I had a Guinness (cost: 500 yen) or two to keep my fluid levels up. The bar is home from home for Yukio – the Agitar office is just around the corner – and it’s also home from home for all the other patrons too. Mirek says that the exact same people were there every time he had been there. A friendly crowd but, then again, they had to be. There was no room to be unfriendly. I was home by about 1:30am and went straight to sleep, ready for my day 3 adventures. Three dinners and one bar in the same evening! Wait until you hear what I had for breakfast! sure, and where did you get this photo? !